Create and submit the in-app purchasable items for your IAP-integrated app before you submit the app to the Appstore. The Amazon Appstore will not test your app until both the app and your in-app items are submitted. Use the developer console to create in-app items one at a time. If you need to create a number of in-app items, you could use the bulk IAP submission. See Create and Submit a Batch of IAPs. You can update an existing in-app item in the live state. The new field values will take effect after you submit this version of the in-app item and it transitions to the live state. After you create the in-app items, you can download a JSON file that contains information about these IAP items. Use this JSON file to test your app with the Amazon App Tester. See IAP Testing Overview. Submit your in-app items before you start Live App Testing. Note: You need to create an app on the Developer Portal before you can add In-App Purchase items to that app. Navigate to the Apps & Services tab to see your apps. Click the In-App Items tab to view, add, or edit In-App items for the app. SKU: A unique string that becomes the ID for the item. 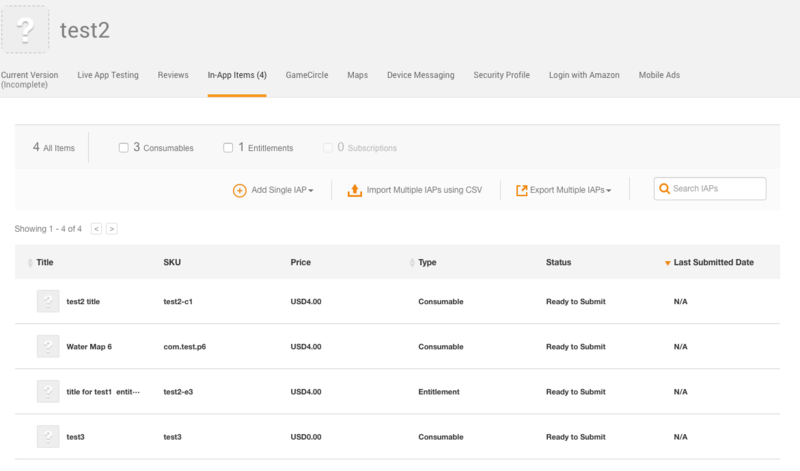 For example, the IAP consumable sample app creates an IAP with a SKU value of "com.amazon.example.iap.consumable". The SKU must be unique across all IAP items in all of your apps. 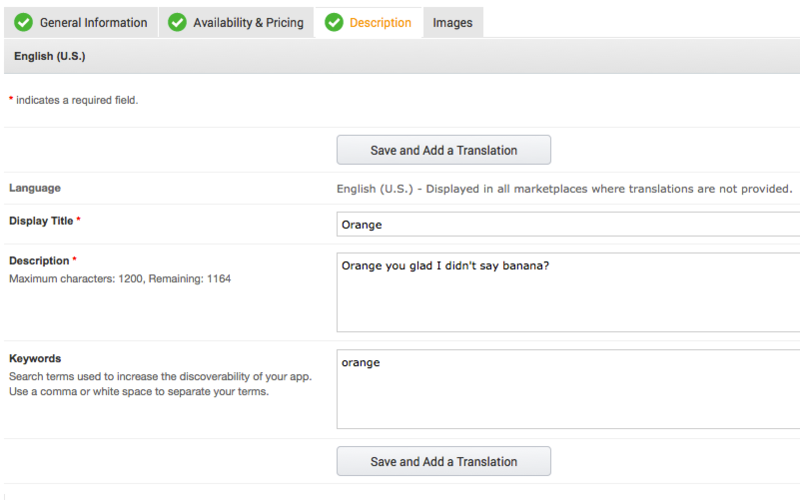 The SKUs used by your app must match the SKUs that you submit to the Amazon Appstore. SKUs are case-sensitive. The SKU has a max length of 150 characters and can contain the characters a-z, A-Z, 0-9, underscores, periods, and dashes. If you are creating a subscription item, this SKU becomes the parent SKU for the subscription period SKUs that you will create later. Availability & Pricing (Consumables and Entitlements only): Set the price and availability for the item. See list item 6a below for additional details. Subscription Periods (Subscriptions only): Specify subscription length and free trial information for the item. See list item 6b below for additional details. Description: Enter a display name and a description for the item. See list item 6c below for additional details. Images: Add images for the item. See list item 6d below for additional details. The tabs shown depend on the type of item that you are creating. Note: You must save the information that you have entered on one tab before moving onto the next tab. If you move from one tab to another without saving, the information that you have already entered will not be persisted when you return to that tab or submit your item. Are you charging for this consumable/entitlement? : Select Yes if you are charging for the item, or No if you intend the item to be free. If you select Yes, the system displays a field to set the base price and currency for the item. After you set the base price, you will have the option of either manually setting the price for other currencies, or allowing the Amazon Appstore to set those prices for you, based on conversion rates from the base price. Valid prices (in USD) can either be $0.00 or range from $0.99 to $400. For the price ranges in other currencies, see IAP Price Ranges for All Currencies. Note: the price that you set for each marketplace is your suggested list price, which includes any VAT or similar taxes that apply in that marketplace. The system displays this list price to end users (along with a note that all prices include VAT). Any VAT or similar taxes are deducted from the list price when calculating Royalties. Subscription Period: Select a Subscription Period. Subscription periods start on the date of purchase. Valid values are Weekly, Bi-Weekly (every two weeks), Monthly, Bi-Monthly (every two months), Quarterly, Semi-Annually (every six months), or Annually (every twelve months). SKU: Enter a SKU (using the same guidelines as the item SKU) that corresponds to this subscription period. For example, "com.amazon.example.iap.subscription.weekly". This SKU is a child SKU of the SKU that you entered on the item detail page. Free Trial: Specify an optional free trial period for the subscription. Valid values are No (no free trial), 7 days, 14 days, 1 month, 2 months, and 3 months. Are you charging for this subscription? : Yes, if you are charging for the subscription, No, if you intend the subscription to be free. If you specify that Yes, you are charging for the item, a field displays allowing you to set the base price and currency for the item. After you set the base price, you will have the option of either manually setting the price for other currencies, or allowing the Amazon Appstore to set those prices for you, based on conversion rates and taxes. Valid prices (in USD) can either be $0.00 or range from $0.99 to $299.99. Click either of the Save and Add a Subscription Period buttons to save the subscription period. If you want multiple subscription period options to be available for this item, you can define each of them the same way that you did for the subscription period that you just added. 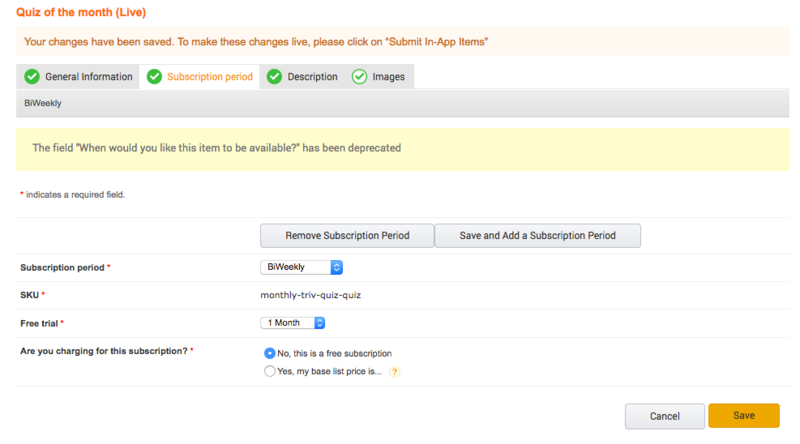 If you ever need to remove a subscription period, select the period and click the Remove Subscription Period button. Click the Description tab to enter description and language information for your item. This tab is the same for all three item types. Display Title: A title for the item that your app can display to the user. Description: Description of the item. Your app can display this description to the user. Keywords: Comma or white-space-delineated keywords, used to improve the discoverability of your app. To save this set of information and add a set translated into another language, click either Save and Add a Translation button. To save the description information and move on, click Save. Click the Images tab and then click Edit to upload a small and large icon for your item. The images tab is the same for all three item types, except that the icon files are optional for Consumables and Entitlements, but mandatory for Subscription items. Small icon (114px x 114px): A 32-bit 114x114 pixel icon for this purchasable item with a transparent background. Your app can display this icon to the user, This icon must be the same as the large icon. Large icon (512px x 512px): A 32-bit 512x512 pixel icon for this purchasable item with a transparent background. This icon must be the same as the small icon. To save this set of information and add a set of localized icons, click either Save and Add Localized Media button. Repeat this process for each of your in-app items. The Appstore does not display IAP information fields such as title or description. You will use the IAP API in your app to retrieve the information fields for each IAP, so that your app can display this information (such as title, description, price, and icon) to the user. For additional details, see step 5 of Integrate the IAP API. When you have entered your in-app items, you can download a JSON-formatted data file containing all of the data for your items. Use this file when you test your app using the Amazon App Tester. See Testing In-App Purchasing. Navigate to the In-App Items tab of your app. Click the Export Multiple IAPs button, and select JSON as the format. You can edit the fields of an existing in-app item in the live state. When you update fields and save the in-app item, the system saves the changes as a new version. The new values will take effect only after you submit this version of the in-app item. Updates to Consumables and Entitlements take effect for all users when the in-app item goes live. For a subscription in-app item, updates to the general information or the description fields take effect for all users when the updated subscription goes live. Note: you cannot edit an in-app item if it is currently in transition to live state (for example, if the state is Submitted or Approved). The Submit in-App Item button remains greyed-out until you provide all of the required information for the In-app item. When it becomes available, click the Submit In-App Item button to submit the In-app item. The in-app item goes through the approval process and then becomes live. You can track the status of the in-app item from the In-App items tab of the app page. Note: If you plan to update subscription prices, read this section carefully. The actual system behavior for a given subscriber depends on the price that the subscriber is currently paying. If you change a subscription price, all new subscribers are charged the new price. However, existing subscribers keep their current price, unless the new price is lower than their current price. The overall intent of this approach is that existing subscribers will never experience a price increase on an active subscription, but they will get the benefit of a price decrease. An existing subscriber pays the new price starting at the next renewal period of the subscription. Subscription IAPs support one or more subscription periods (such as weekly or monthly). You configure a SKU and a price for each subscription period that you offer. If you change the subscription price for a subscription period, any new subscribers to this subscription period will pay the new price. If you raise the subscription price for a subscription period, existing subscribers (including customers currently in the free-trial period) continue to pay their original price. If you lower the subscription price for a subscription period, existing subscribers who are currently paying a higher price (including customers currently in the free-trial period) will now start to pay the lower price. If a customer cancels and then starts the subscription again, they will pay the current price, which may be different from the price of the subscription that they cancelled. An existing subscriber has a monthly subscription with auto-renewal. The current subscription price is $12.99. At the next renewal period (and beyond), the existing subscriber pays $10.99. Note: This action does not affect any subscribers currently paying less than $10.99 per month. At the next renewal period (and beyond), the existing subscriber continues to pay $12.99. Any new user signing up for this subscription will pay $14.99 a month. You create a new monthly subscription. Your intent is to offer a six-month introductory period at $9.99 per month, and then start charging the full price of $12.99 per month. You create the subscription with a price of $9.99 per month. After six months, you raise the price to $12.99 per month. Any subscriber that signed up during the introductory period will continue to pay $9.99 per month.